The dermal filler course is structured to optimise our candidates time. We have developed some of the best online resources to ensure our candidate can review any part of the theory for this course as and when required. To optimise time and your learning experience we use recorded web seminars to deliver theory for this course. You can also access more educational resources and templates to assist you on the Medical Aesthetic Academy web site. All of these resources have verifiable CPD points approved. 1. Complete the online lecture by our trainer from their home or office. This covers the full theory for the dermal filler course. 2. Attend the knowledge review and practical dermal filler injection workshops at one of our training venues. This can also be arranged as a bespoke course at your clinic. 3. Perform the injection techniques under the supervision of our expert trainers. 4. Receive your certificate at the end of the practical workshop. 5. Review your complimentary learning and theory as often as you require before and after the dermal filler course. 6. Download the complimentary dermal filler templates and documents from your online Academy account. 7. Review the complimentary guide to developing a cosmetic practice. What will you learn on the dermal filler course? Yes, if you look at the dermal filler training course outline the candidates will spend the majority of the course injecting patients who are provided by our cosmetic treatment program. This program selects patients with suitable indications who will be injected by candidates under close supervision of the KT trainers. With dermal filler extensive clinical training is essential to ensure a good level of confidence. 1. Complete the 2 hour online lecture conducted by our surgeon. This can be reviewed as often as you require. 2. Attend the knowledge review and practical injection workshop. Completing the online lectures and educational resources before attending the practical session will allow candidates to focus on the practical skills when attending the course. 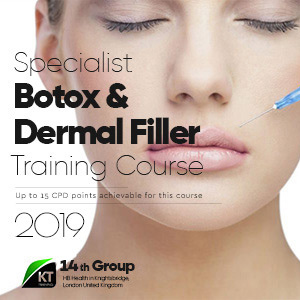 KT Training candidates also have the same option for th dermal filler training workshop, this course can be completed on the same day during the afternoon session..
What are the resources KT Training provide to our BOTOX course attendees? Our foundation botox training courses are recognised by all major insurance companies and have CPD points approved for doctors, dentists, nurses and pharmacists. Therefore our candidates will be ready to source insurance and start their journey in aesthetic medicine when completing this course. KT has provided Botox training courses since 2005. During this time we have developed a range of introduction modules and workshops for new students plus master classes for experienced aesthetic practitioners. We provide the full range of foundation courses. These include the introduction to BOTOX® and dermal filler training, chemical peels, micro needling and mesotherapy. We also have the advanced dermal fillers and advanced BOTOX courses for candidates who wish to develop their skills to provide a more extensive full range of cosmetic treatments with toxins and dermal filler. The non-surgical master classes are for practitioners who wish to develop their expertise with a wider range of products and procedures. KT Training, has over 12 years experience in developing doctors, dentists and nurses to be successful in aesthetic medicine. We provide all the resources and solution for your training needs. Our courses include practical sessions were candidates will be treating patients under the supervision of the expert trainers. The hands on workshops include the assessment and treatment of a range of patients. This training model provides the best standard of practical experience available.